Hurry Up and Slow Down ! Last week I took some time to rest, get some things done and feel better - sort of a 'mini' break. Aside from sniffles I do feel better this week. The count-down to Christmas Day has begun. 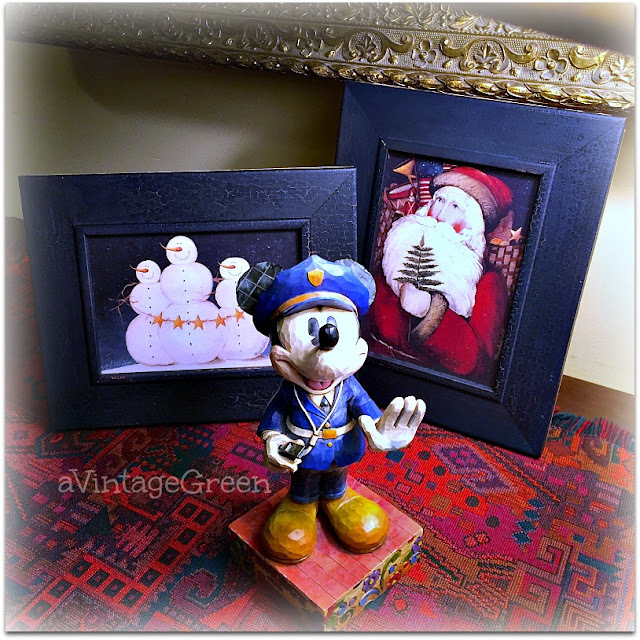 I love Christmas music and light displays but the Disney Mickey Mouse Preserve and Protect Cop is telling me 'slow down'. 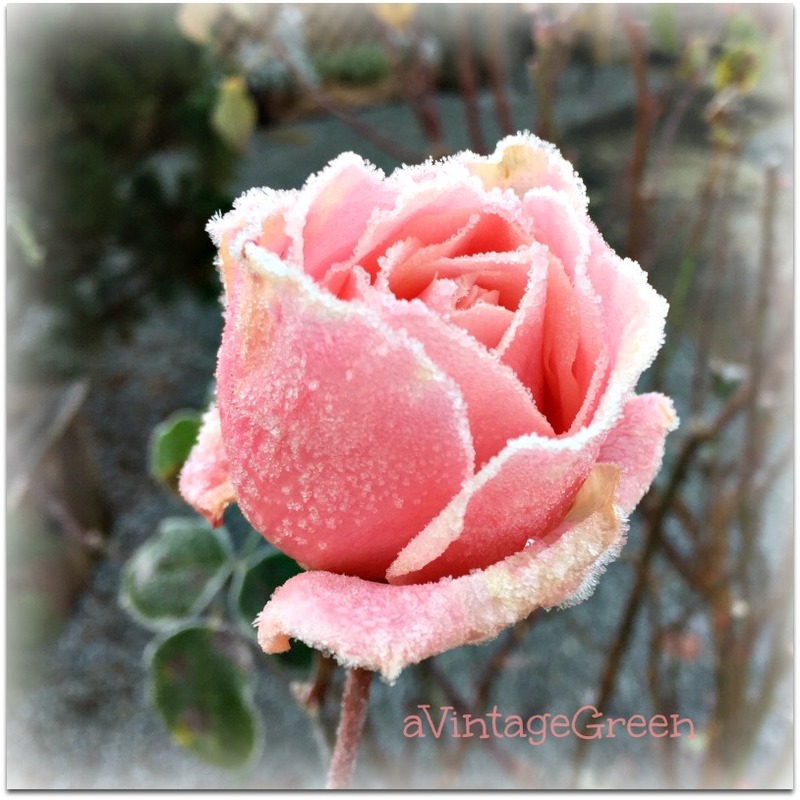 Pink rose has lasted right into the frosty mornings. So far no decorating (well, hardly any) has happened although DGS is here this week and ... maybe some outdoor lights will be strung. Families create their own traditions and being flexible is a very good way for families to celebrate with families of the heart. Instagram and FB keep family and friends caught up on news as do cards, letters, emails and texts. 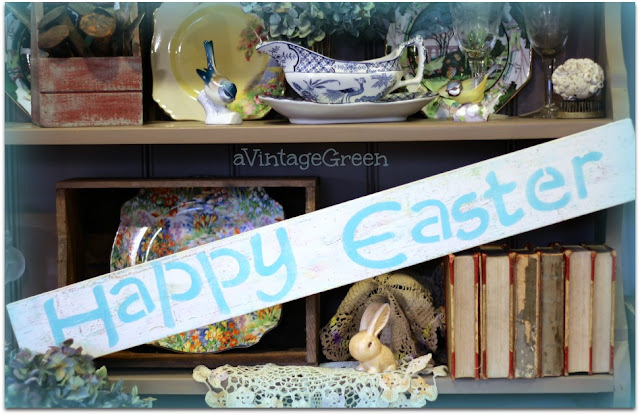 Today we embrace many ways to keep in touch and celebrate special occasions. 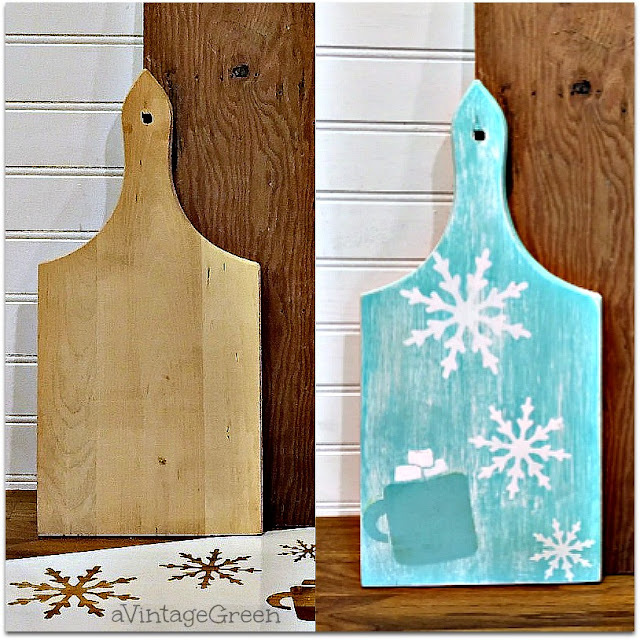 Regular readers know that I enjoy stenciling. 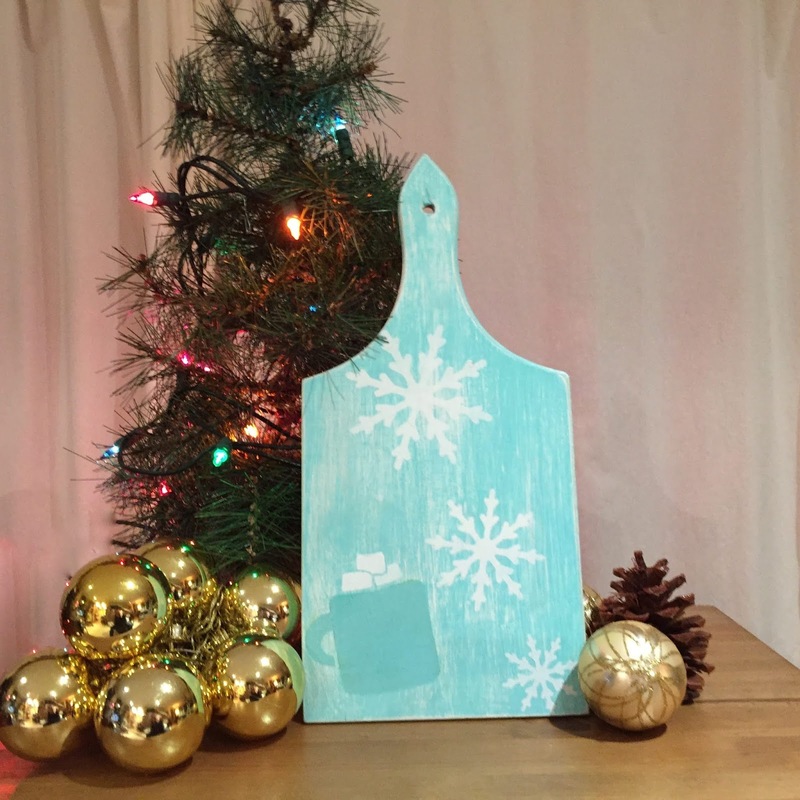 Project: Snowflakes and hot chocolate stenciled on a cutting board. 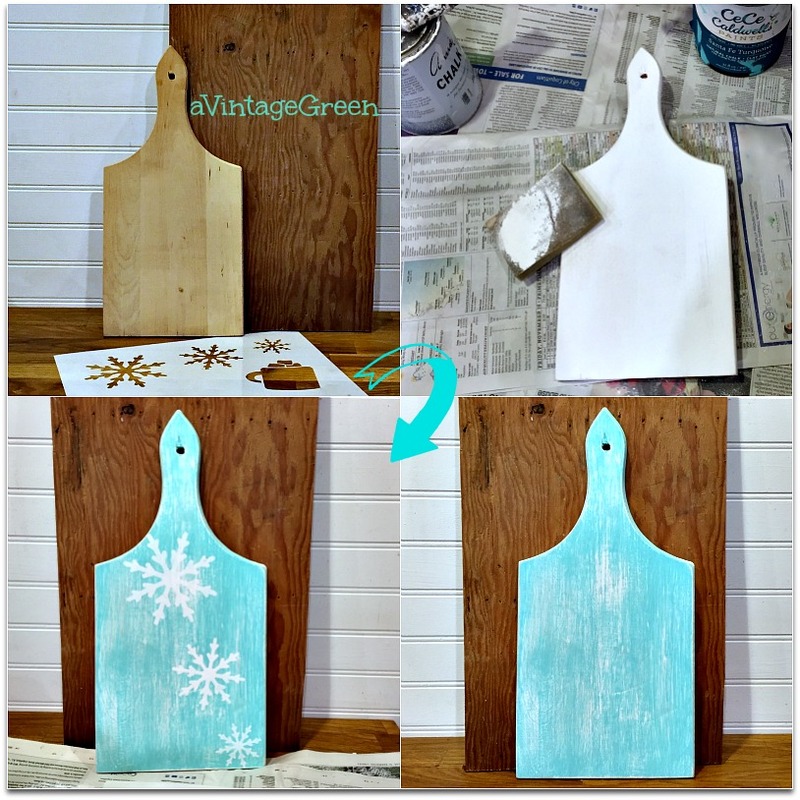 Donna of Funky Junk Interiors is the source of the snowflake stencil (and she has just added two new Christmas stencils to her shop) . • Stencil and paint brushes. 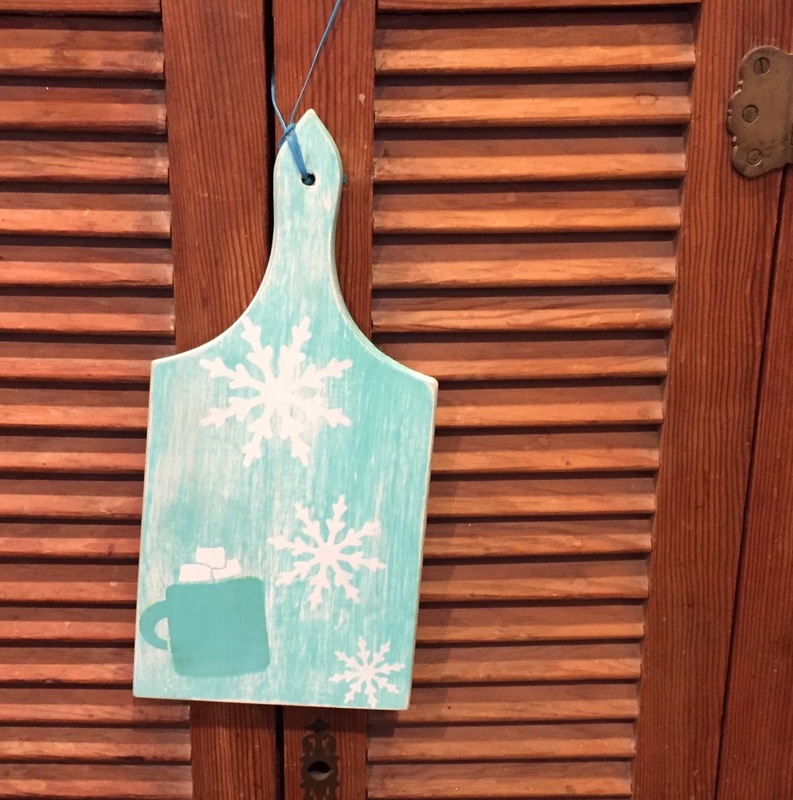 The mug has green chalk-paint under the turquoise so it stands out. You have such a gift for turning any hum drum item whatsoever into a charming and unique treasure! I love the words redeem and redemption! You are the Queen of Redeeming things! Happy Thanksgiving to you and yours! My ham is in the oven and I’m sitting up in bed with my coffee at my side. It’s a good day to count our many blessings! You are one of mine! I think I need to slow down too, usually I have a lot of decorating/baking completed by Dec 1. This year the wreath is on the door/we put up the front outside lights but I need to finish off the back lights and replace 2 strings on the front bushes that burned out. That is Sundays project. Other than that I need to get my US Christmas cards (for people who still appreciate receiving a card) by Dec 5. I also need to finish some shopping as we do our family Alberta trip Dec 7 and still need a bunch of things/make arrangements for that. This year though there will be a real tree so that won't happen until after the 12th based on our travel plans.....I already feel more stressed! That turquoise color is just gorgeous! 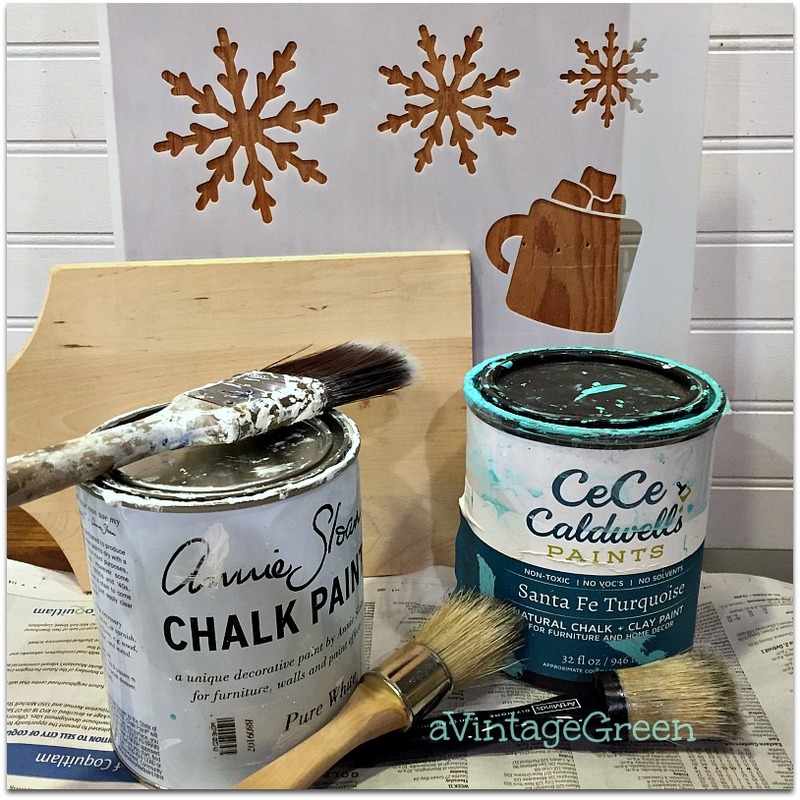 Beautiful job with the snowflakes. Yes, that color is just happy. It's my favorite! I have done zero decorating, but I just ordered some lightweight fairy lights to put on our palm tree in the kitchen which will serve as our holiday tree this year. Your cutting board turned out adorable! Thanks for sharing it at Talk of the Town. Joy this is such a pretty stencil. Why it can go in any room of the house and make it feel instantly cozy.